The more fascinating of the two is Marina Zenovich's Odd Man Out, a continuation of Zenovich's Roman Polanski: Wanted and Desired (2008). I considered her previous film among the best released that year for its ability to coherently and objectively present the details behind Polanski's flight from the U.S. before being sentenced for his sexual abuse of a minor. Odd Man Out feels wrong-footed from the start in that Zenovich, so effective in keeping any editorializing to a minimum in her previous Polanski doc, seems to aggrandize her own involvement with the filmmaker as a way of getting us into the story about Polanski's subsequent 2009 arrest in Switzerland. Yes, though the notoriety of the unethical judge and his misbehavior had increased as a result of Wanted and Desired's release, the most fascinating aspect of the Polanski's arrest in Switzerland is not Zenovich's culpability. As Odd Man Out itself points out, it is the almost conspiratorial machinations behind the scenes in the usually neutral Switzerland that really fuel the drama. 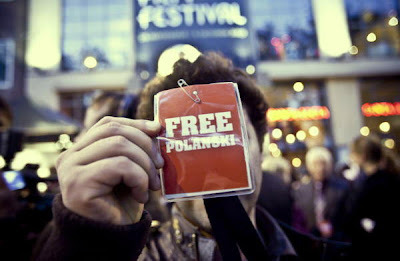 Why was Polanski, who has a house in Gstaad that he visited frequently over the years, suddenly taken into custody now? 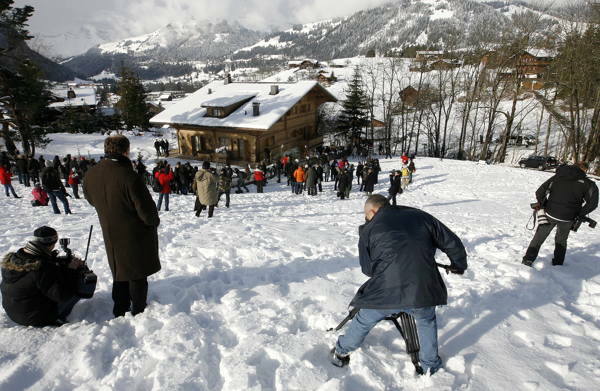 In the wake of the 2008 financial meltdown, the U.S. wanted UBS to release the names of over 50,000 American accountholders hiding their assets. Allegations arose that the Swiss arrested Polanski as a stopgap measure to alleviate the pressure the U.S. was applying to UBS. With these legal dealings (or double-dealings, as it were) forming the spine of Odd Man Out in much the same way the court proceedings did in Wanted and Desired, sidetrips taken to revisit Polanski's now middle-aged victim or exploring Zenovich's overwhelming sense of guilt seem like attempts to sensationalize the case all over again. I wrote about my personal feelings on the Polanski matter once before. But I keep coming back to the fact, that no matter what my personal feelings are, in a purely legal sense, Polanski is right to be distrustful of a system that had promised him one thing in a plea bargain agreement before ultimately reneging on that commitment. In straying too far from her central thesis, Zenovich's documentary seems destined to muddy up the legal waters once again. 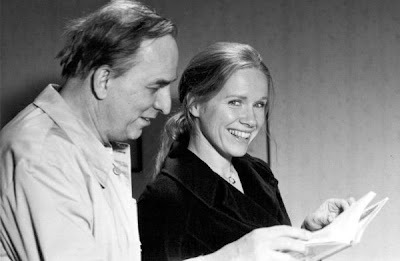 Liv and Ingmar is a sort of memoir by Liv Ullman, an extended interview in which the Norwegian actress recalls her complicated relationship with her director, mentor, and lover, Ingmar Bergman. The most glaring fault in Dheeraj Akolkar's documentary is the way it fails to give a voice to Bergman. Compare Liv and Ingmar to another film, Marie Nyreröd's brilliant Bergman Island, in which the Swedish director approaches his films and his private life the way one would expect a filmmaker would, from a fairly objective vantage point. The highly emotional Ullman, not surprisingly, does not see things as clearly. Akolkar is conscious of this, to an extent. The film has a more romantic sheen, divided in chapters titled "Love," "Loneliness," "Rage," etc. There is no small measure of artifice throughout, even in poignant moments such as when Ullman finds a note she once sent Bergman tucked in a small stuffed animal he owned. But while Bergman's ability to be his own harshest critic made it unnecessary to invite the commentary of others in Bergman Island, Ullman's inability to look outside of her own tempestuous feelings call out for the inclusion of Bergman's voice in something more extensive than a few letters read aloud by an actor. This is especially important because the perception formed from her descriptions is that of a cruel, possessive, autocratic Bergman. I may have gone in to the movie with a preconception, I admit. But the film is titled Liv AND Ingmar, when it should really be Liv ON Ingmar. Roman Polanski: Odd Man Out is playing at the 50th New York Film Festival as part of its Cinema Reflected sidebar at 4:15 pm Saturday, September 29th at the Lincoln Center's Walter Reade Theater, 165 West 65th St (north side between Broadway and Amsterdam, upper level), New York, NY 10023; and at 9 pm Tuesday, October 2nd at the Elinor Bunin Monroe Film Center's Francesca Beale Theater, 144 West 65th St (south side between Broadway and Amsterdam), New York, NY 10023. Liv and Ingmar is playing at 6:15 pm Monday, October 1st at the Walter Reade Theater; and at 8:45 pm Tuesday, October 9th at the Francesca Beale Theater.